And we’re off! Our first family road trip together. We have driven all day before to get to family, but never day after day after day for a family vacation because we usually fly to our destination. We started off our day at the German American Heritage Center, which is located in Davonport, Iowa. You know I love my history and especially family history. Most of mine traces back to Germany. I was pleasantly surprised with this little museum. There was lots of interesting information on German immigrants. My favorite thing was the videos of German immigrants (portrayed by actors) and their true stories of what life was like for them as they came to America. I had to watch them all! We took the German experience all the way and finished with dinner at Bier Stube bar and grill. I meant to take pictures, but I was so excited to eat when the food came, that I forgot! But it was a great place for German food. You’ll have to trust me on that one. Our next stop was in West Branch, Iowa at the Herbert Hoover Presidential Library and Museum. We really enjoy learning about our Presidents and this makes our fifth Presidential Library that we have visited. I learned so much! Honestly, I wasn’t familiar with Hoover and what he had done over his lifetime. 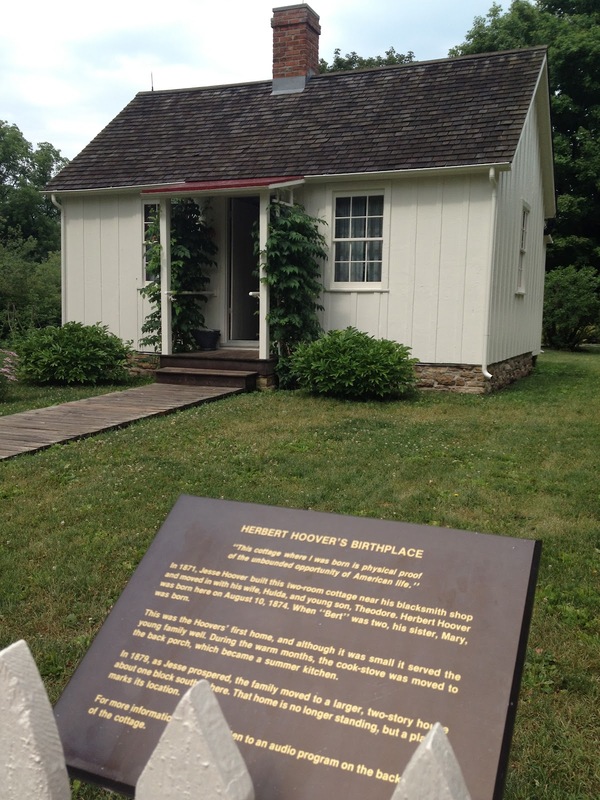 Not only is there a museum, but also an outdoor park area with Hoover’s childhood home. This park is run by the National Park Service and therefore a park ranger was in the house to answer questions, which was very helpful. The front of the very small home. The back of the home with the porch. The park was great to walk around, but the museum was where we learned the most information about Hoover. There was a gift shop, where I bought my Iowa spoon, a movie about his life and LOTS of memorabilia from his entire lifetime. There was a table set with several Presidents White House china which I found interesting. Below are pictures of each set of china from six different Presidents. I like all of them, with my least favorite being President Johnson’s and my favorite being President Eisenhower. What is your favorite? I’ll leave you with this beautiful shot I took as we drove across the entire state of Iowa. What a peaceful, beautiful scene to enjoy as we looked out the car windows. What a great blog! Thanks so much for sharing this piece of Iowa with your readers! Thanks, I'm glad you like it! Please join the site & subscribe by email. I love to hear what people think! 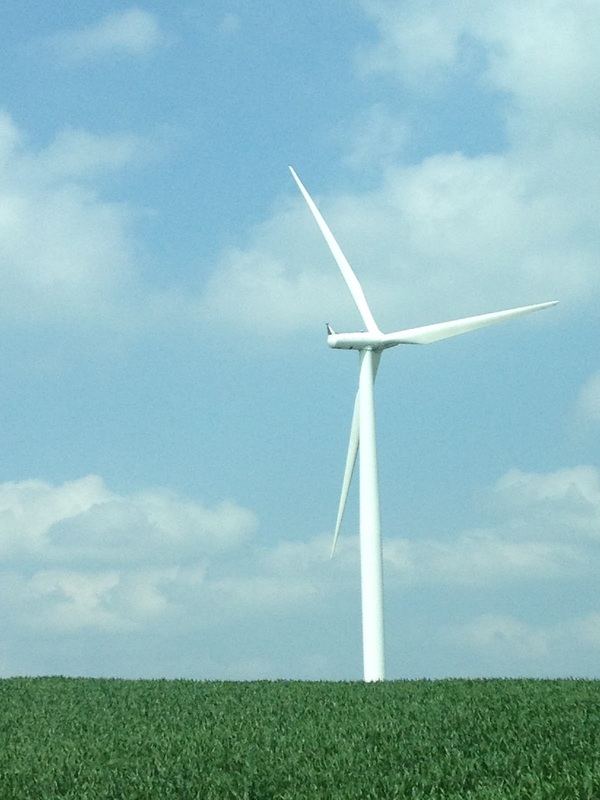 We did have a great time in Iowa…beautiful green fields and blue skies!